Cleaning Dentures: What's the correct method? How to clean dentures. 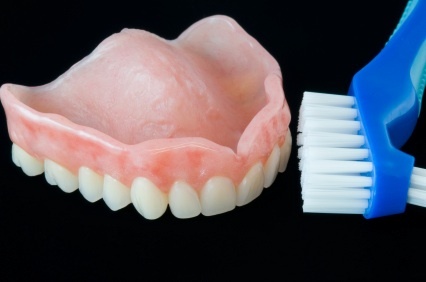 When it comes to cleaning dentures, a lot of people are unsure about what's best. Have you ever been shown how to clean dentures by a dentist? Probably not. But it's very important to clean your dentures in the right way, otherwise food debris and bacteria will build up inside them. For total cleaning, you WILL need an ultrasonic denture cleaner. But first, you need to get your dentures as clean as possible with a brush. HOW? Here's my best professional advice! First, you must take the dentures out of your mouth. Do NOT leave them in place and try to clean them like natural teeth, with a tooth brush and toothpaste. This just doesn't work. This will NOT clean the INNER surfaces of the dentures - THE MOST IMPORTANT BIT! Once you have taken your dentures out, you need to use a soft brush to clean them. What sort of brush? I recommend a small nailbrush. It's the simplest and cheapest, and works very well. I think that a normal tooth brush is too small and the bristles too soft to clean a denture well. Remember to give the brush a good wash under running water after you have scrubbed your denture! If you want to use any cleaning paste with the brush, DO NOT use regular toothpaste. It is too abrasive for dentures, and will score the surface leaving a rough matt finish. I recommend using a plain and unscented liquid hand soap, because this does the job well, and is simple and inexpensive. If you want to skip to the BEST cleaning solutions, click HERE to go to the BEST DENTURE PRODUCTS! But I recommend that you finish reading this page before you click onwards - there's another link to Best Denture Products at the bottom of this page. Now, hold your denture in the bathroom wash basin, close to the bottom. That way, if you should accidentally drop the denture, it won't drop more than an inch or so. Put a little liquid soap on the nail brush, and slowly scrub the inside of the denture. This is the area that rests on your gum. Work the brush carefully into all the little nooks and crannies of the denture, using a firm scrubbing action. After 30 seconds or so, turn the denture round so that you can scrub from a different angle. Now put the brush down with one hand, and keep holding the denture low down in the wash basin with your other hand. Then use your free hand to turn on the tap, and gently rinse off the inner surfaces of the denture. After you have cleaned the inside of the denture, you can carefully turn it over, pick up the brush again, and slowly scrub all around the teeth. It's important to go slowly, because the bristles on the brush work much better that way. If you scrub really quickly, the bristles can skip over small recesses in the denture surface, leaving bacteria behind. Once you have gone all around the teeth, you can put the brush down with one hand and turn on the tap again. This time, hold the denture under the running water, and use the brush to lightly scrub any traces of soap off. DONE! Now you can put your dentures back in. If you want to leave your dentures out for any reason, you DO NOT have to store them in water. They will not shrink or warp if they dry out! It's best to leave them in a plastic denture box or case, where the water can evaporate. Cleaning dentures properly is essential for getting rid of bits of food on the denture and preventing a build-up of bacteria. Following the instructions above will get your dentures clean, but may not remove ALL bacteria. For COMPLETE cleaning, you will need to use a denture cleaner such as Cleanadent Crystals - see my guide at Denture Stomatitis, AND an ultrasonic denture cleaner. You would use this AFTER scrubbing your dentures as I have described above. Look at my guide to ultrasonic denture cleaners HERE. I REALLY RECOMMEND THAT YOU LOOK AT THIS PAGE, AND GET AN ULTRASONIC CLEANER!